Sunday evening, I noticed the golden hour glow outside and headed out to take a few pictures. As soon as I opened the door, I saw that Mama and Baby Deer were out in our side yard. Do you suppose he’ll ever grow into those ears? 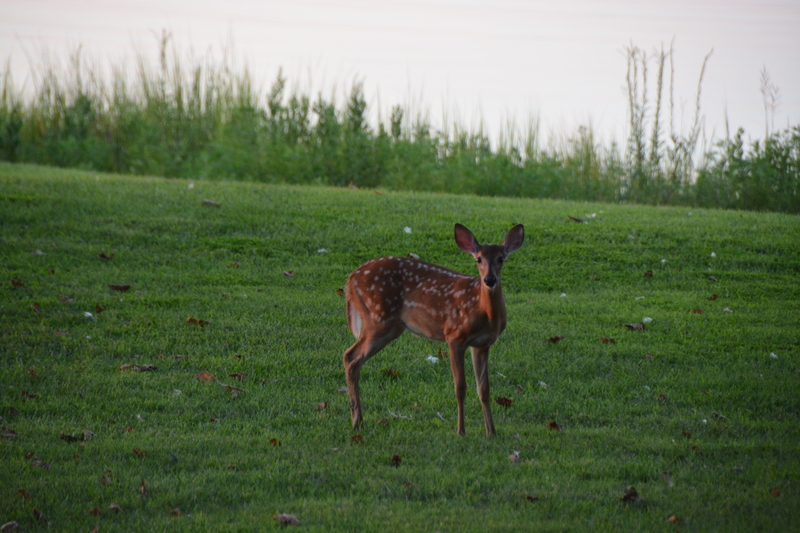 A few minutes later, Baby Deer ran to the other side of the yard from Mom, and I found myself in the middle. Mom looked anxiously at her baby. And, then, at me. 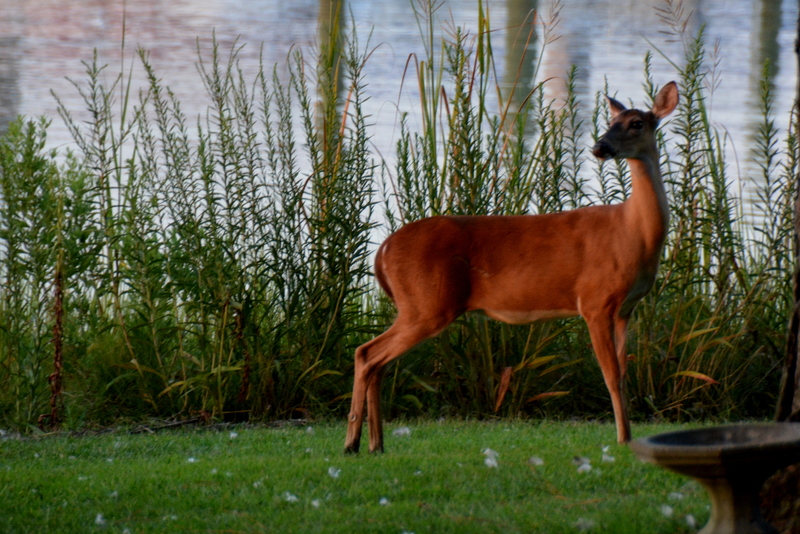 I don’t know much about the body language of deer, but I knew enough to immediately get myself back inside. Between a wild animal and her baby is not somewhere I want to be. 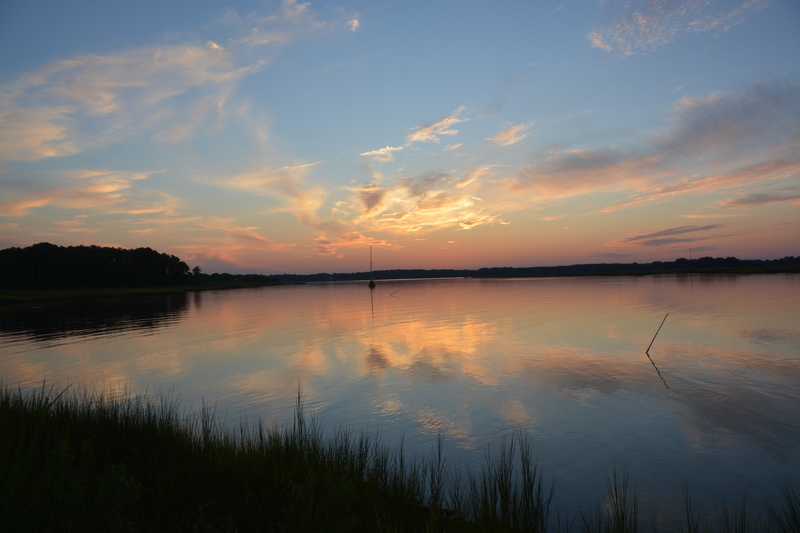 Once all that was settled, I continued on with my purpose for being out there in the first place: sunset pictures. A sailboat was anchored just off from our yard. It was one of those “soft” sunset skies. Well worth fighting the mosquitoes and chancing possible Mama Deer attacks to capture. 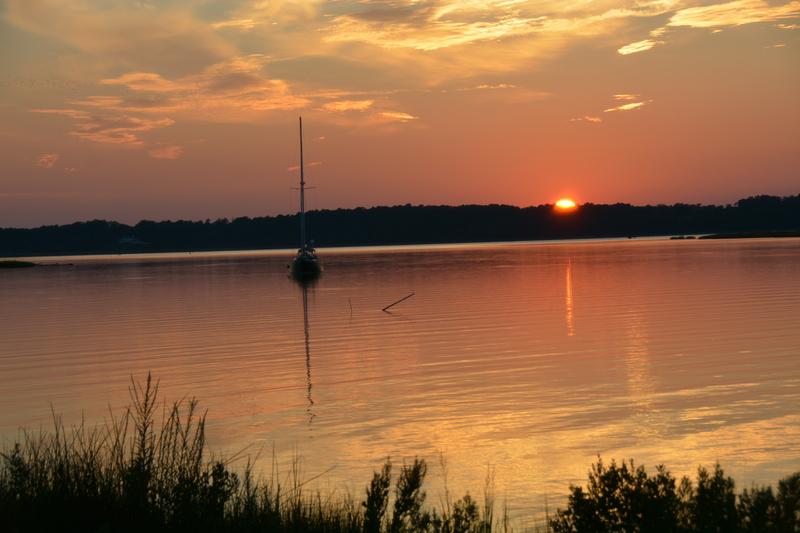 This entry was posted in Days at Home, Sunrises/Sunsets and tagged mama deer and fawn, sailboat in sunset, sunset. Bookmark the permalink. 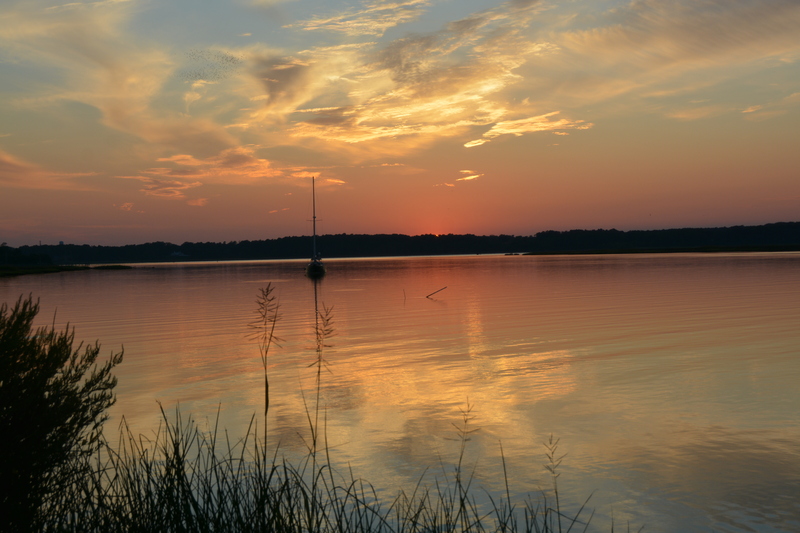 Beautiful…………..such a calm series of sunset photos……. Protective Mom – sweet…and I love the soft sunset – so peaceful. She’s got her eye on you, Dianna. 🙂 Beautiful sunset photos! 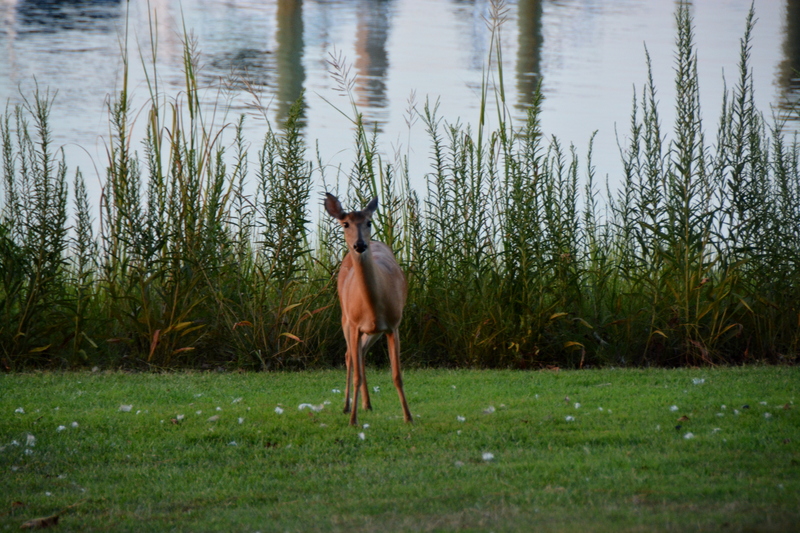 Ah…the sunset more than makes up for the stare down from Mama Deer. Love, love, love your photos today. Breathtaking! & Mama Deer definitely had her eye on you ! Beautiful sunset. Glad you were able to get pictures of it safely, without provoking a mama deer. You could always bring a sweet potato vine as a peace offering. Lovely sunset and deer what more can you want. I love photographing deer. Your little fawn is so precious and mom did look protective. Gorgeous sunset. Beautiful sunset! So that’s who has been munching on your flowers! !